Its been a while since I visited Andrew Lee, Bluestone beat on the Whiteadder. So arriving early Saturday morning with the forecast of a ‘scorcher-of-a-day’ my expectations were not high of either seeing or connecting with fish. Andrew is the most helpful and jovial of hosts – and after a welcome mug of hot tea I was ushered into his little Suzuki car to the upper part of the beat with spinning rod and 11ft Bruce double handed rod firmly attached to the bonnet. On the way he talked about how his team had improved access in and out of the water, sign posted the beat and produced a super map explaining where the pools were. The upper reaches of the beat Andrew calls his ‘little Iceland’ and you can see why, a beautiful weir flows into a lower pool similar to those you would find in Iceland. He meticulously explains each pool as we travel down the beat from access points, taking places, how they fish in different conditions, flies to use and rods. 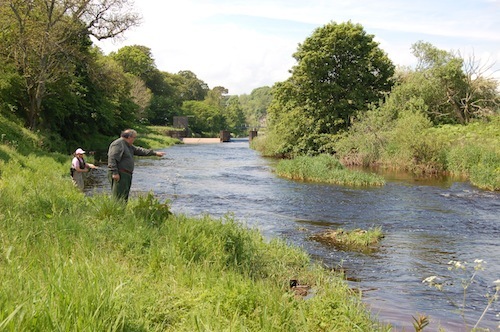 The upper beat enjoys the luxury of the Hutton Castle gauging station, rods watch this with much interest. Anglers the day before had lost 3 and landed a 12lb salmon on upper fence end pool. 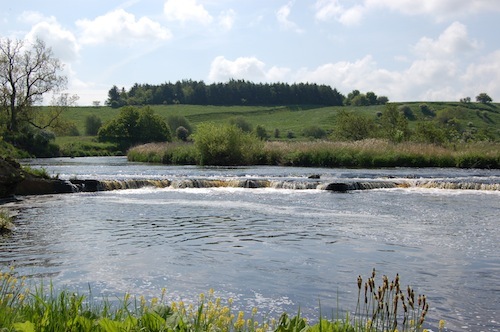 The upper beat fishes well when the water is approx 1ft 4-6″ on the gauge – “when its lapping onto the ramp, approx 2″ over the side sill” says Andrew. Andrew was keen for me to fish the Lower Fence end pool, a lovely section of water, perfect for 12, 13ft double handed rods or the popular 11ft switch rods. We had come over-gunned with 14ft rods – so I was loaned his favourite 12ft Bruce rod, equipped with a floating line, 12lb maxima and a sparsely dressed cascade double, glistening in the morning sunshine. He was then off – to the local butchers at Norham to get lunch. During lunch talk was about the fish seen on the lower beat – entering the system, sea trout had been spotted. Good signs for afternoon. Fishing with access made from manicured lawns felt like I was fishing a beat that had grown up. The simplicity and beauty of casting tight loops of line from a 12ft rod across the river, shimmering hatches of olives and sedges dancing in front of your every cast. My senses were awakened when the sharp tug of my line – fish on – maybe not! A resident fish broke the surface nearby – with a smug satisfaction I carried on casting down the pool. 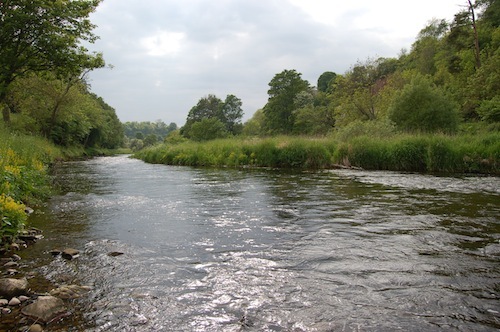 Finnock and mature one wintered sea trout were seen later in the afternoon – encouraging to see. Andrew is extremely helpful – a real gentleman who wants his guests to have a great days fishing. This beat is perfect for beginners to experienced anglers looking to challenge themselves. Worth a fish – DEFINITELY. 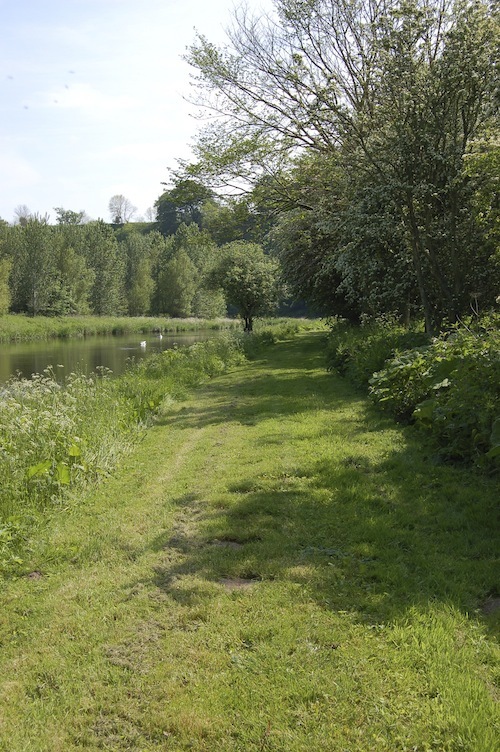 A days fishing at Bluestone in June is £45 rising to £60 during peak times. The beat enjoys a virtual ghillie guide. Anne Woodcock fished Bluestone beat Saturday 1st June 2014.